If you’re a Canuck rock fan, there’s a damn good chance you watched the big Tragically Hip concert from Kingston that was aired on the CBC last night. I didn’t see it live–I was busy watching the kids get their jollies at opening day of the PNE–but I made sure to record it, and watched it when I got home. I’ve heard a couple of capsule reviews–from a local classic-rock station and a TV reporter for the CBC itself–claiming that it was an incredible performance from beginning to end. As much as I love the Hip (I’ve seen them live at least 10 times) and have the utmost respect for the courage Gord Downie has shown by touring in the face of terminal brain cancer, my personal review isn’t quite as glowing. Overall it was an historic gig, bursting with emotion, but I actually found myself fast-forwarding through certain songs. 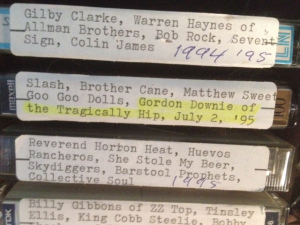 I’m just not crazy about the Tragically Hip’s more recent material. Hey, it doesn’t make me a bad Canadian. I’m just trying to be honest here. For me the finest moment was during one of the several encores, when the band played my fave Hip tune, “Nautical Disaster”. Obviously, considering his illness, nobody expected Downie’s vocals to be as strong as they have been in the past. But for brief moments during “Nautical Disaster” they actually were–or it seemed that way to me at least. Anyway, like I say, all-in-all it was a must-see show. I’m glad I recorded it. The Tragically Hip are surely one of Canada’s greatest bands ever, right up there with Rush and The Band. I liked seeing Justin Trudeau standing there in his black Hip t-shirt, nodding and smiling at Downie while the singer said nice things about him. I started to wonder if there might be a few prime-ministerial brewskies flowing backstage afterwards, in keeping with the celebratory vibe of the event. Which brings me to that time back in July of 1995 when I asked Downie what it was normally like in the dressing room after a Tragically Hip gig.